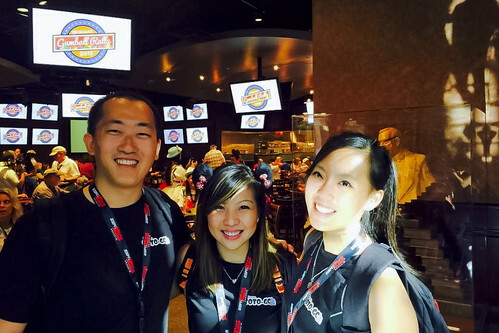 On May 2nd, 2015, my friends and I participated in MiceChat's 9th annual Gumball Rally! 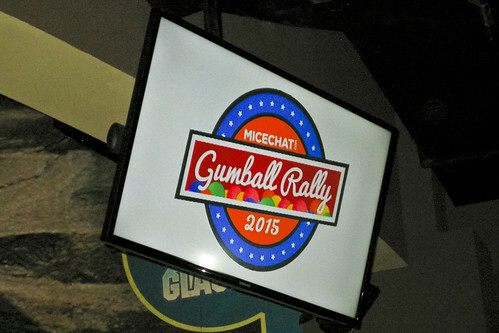 What is the MiceChat Gumball Rally, you ask? 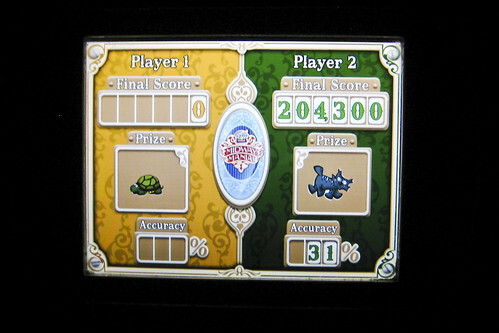 Well quite simply, it's a "race" at the Disneyland Resort Parks to see who can ride the most attractions in a single day! It's loads of fun! 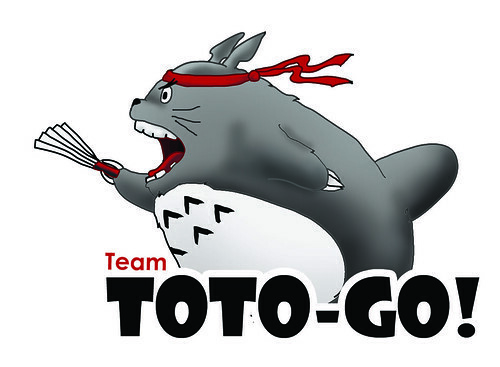 This would be my fourth time participating, but the first time with my new team, Team Toto-GO! The day started off quite early since check-in was at 7:30AM. 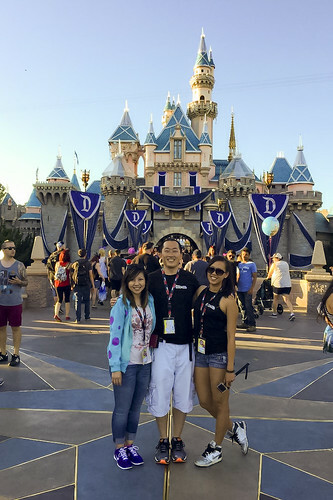 My friends Kristy and Christine met at my place, and then we all carpooled over to the Disneyland Resort. Check-in was at the ESPN Zone in Downtown Disney. As soon as we entered, my friend Mamabot greeted me with the biggest hug (she seriously gives the best hugs)! She helped check us in before sending us off to the dining rooms to eat our pastry and fruit breakfast. As we ate our breakfast, we saw a few friends (hello Team Bambo!) and made a few new ones as well (the MiceChat Gumball Rally has seriously some of the friendliest people). One thing that I noticed while we were eating was the rules were missing from our team packets. Huh, that's weird. After eating, we decided to take a look around. 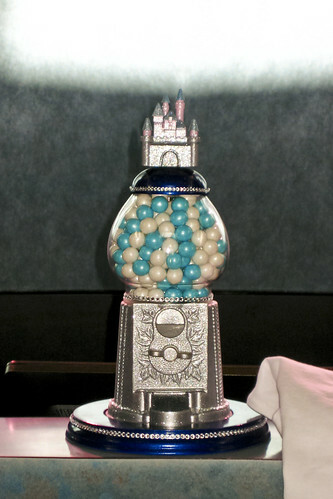 Look, it's this year's Gumball Rally trophy! We also decided to take a team photo while we waited for the Rally to start. Here's the back of our shirts with our team logo! Kristy did an amazing job with the designs as she always does every year! The world of Studio Ghibli has entered a state of shambles with the recent news of retirement from its Co-Founder and Director Hayao Miyazaki. Without Miyazaki's artistry and talent, his beautifully crafted world of Studio Ghibli has begun to lose its coloration. What once was a vivid and lively world full of hues has now become mute and dull. The neglect has caused some characters and lands to fade, and eventually, disappear. Totoro, the friendly forest spirit from 'My Neighbor Totoro' and face of the animation studio, has dutifully picked up the responsibilities left by Miyazaki to protect the world of Studio Ghibli from vanishing from existence. Totoro has searched far and wide to find a new talent to save his world. However, Totoro has found no other artist who is able to live up to the genius that is Hayao Miyazaki. Word has spread to me of your current predicament. Do not lose hope. I know of an ancient artifact that will be the solution to all your troubles. It is a mysterious encasement full of magical, colored orbs. It contains an unparallel amount of power that can sustain your world forever. However, be warned; the artifact only appears once a year in my world in an event called the 'Gumball Rally.' You will need to overcome many obstacles and conquer many lands. Your expedition will be a harrowing one and will not be easy, but if successful, you will be able to save your world. Good luck. With the determination to save Totoro's world, these heroes will embark on a perilous journey to retrieve the mystical artifact. Will these heroes succeed? Or will they perish in their noble quest? Pretty soon, Dustysage called the team captains to meet him in the main room. He wanted to go over the rules with us before we start. When all the team captains were gathered, Dusty and the MiceChat crew began handing the rules out. Once all the captains received the rules, we all read through the rules together. And then... we all gasped at the rules all together! We could not believe our eyes! "NO FASTPASS OR SINGLE RIDER WILL BE ALLOWED"
... well okay, no I didn't but it sure felt like I did! No wonder we didn't get the rules ahead of time this year! Dusty wanted to gather all of us in a single room and watch our faces drop as a collective whole when we read the no FastPass rule. And that wasn't even the end of it! In addition, this year's Gumball Rally booklet was separated into TWO booklets (one for Disneyland, one for DCA)! To get the other booklet, you had to turn your first booklet in by 2:00PM! Once you turn your booklet in, you could not get it back. You were basically blind for the other park! AND THAT'S NOT ALL, FOLKS. If that wasn't rough enough... ALL. ATTRACTIONS. WORTH. THE. SAME. POINT. I have never seen a room full of Rally-ers panic like the way we did. We were all shell shocked! I thought maybe I'd be able to handle the no FastPass rule and separate game booklets, but I was not prepared for all of the attractions being worth the same point. Brutal! One semi twist that I particularly liked this year though was that everyone had to start at the Picnic Area. 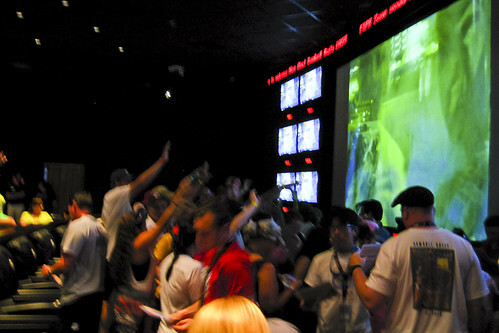 In previous years' Gumball Rally, it always started at the ESPN Zone and it was always a mad dash to the front gate. This year, we all walked together to the Picnic Area and chose which Park (and subsequently which booklet) we wanted to do first. Once all team captains had a game booklet in hand, the Gumball Rally crew "released the gates" and then we were all off! 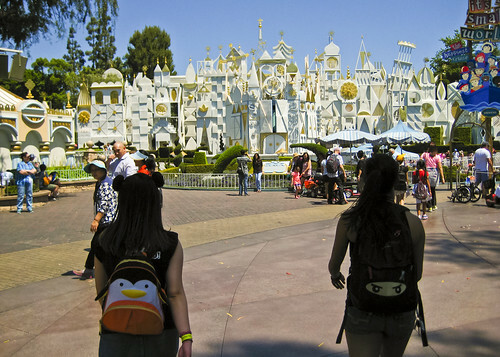 We chose to head to Disneyland first. 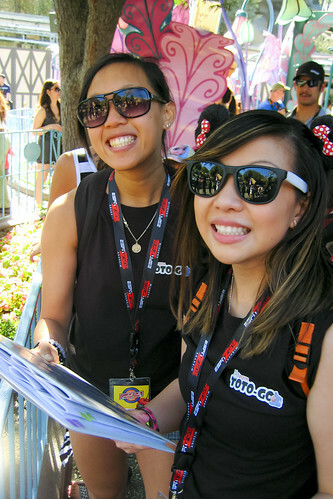 As my team and I walked towards the front gate, I began looking through Disneyland's booklet to see what attractions were in this year's Gumball Rally and to come up with a new plan. With the difficult twists this year, my original plan went out the window! Our next destination was Fantasyland since most everything at Tomorrowland already had about 20 minute waits (darn you Magic Morning!). We headed towards Alice in Wonderland to count how many rabbits were on the painting on the left side of the "down the rabbit hole" scene. Here we are finally taking a breather to review the rules for this year's Gumball Rally. 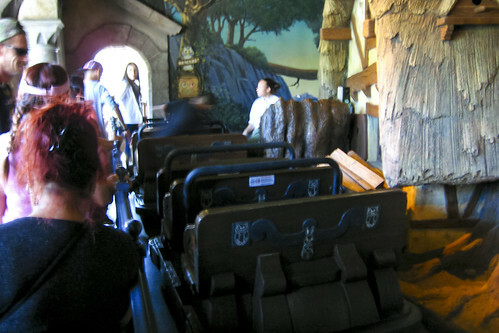 Once we were off of Alice, we headed for the rest of Fantasyland to hit up Toad and Snow White. At Snow White, we had to "look quick" to see what name was written on the pie at the beginning of the attraction. Here we are almost on Snow White! The next attraction we headed over to was Pinocchio. As luck would have it, the attraction went down right when we were about to board :( A family took too long to board at the unloading area. It looked like the mother and father were having an argument. While the mother and the kids were inside the vehicle, the father was standing out of the vehicle saying something to the mother. As this was going on, the lights around Pinocchio started blinking, probably a warning signal for the CMs to let them know that the attraction was about to go down if they didn't send more vehicles through. By the time the father finally got inside the vehicle, the attraction went down. We asked the CMs how long it was going to take for the ride to come back up and they gave us a rough estimate of about 20 minutes. NOPE! We needed to cut our losses and leave. But the problem was because we were at the front of the line, we were only allowed to exit through the entrance, which meant we had to fight through a sea of people behind us. Yeah, that wasn't happening. We made our way to Critter Country in high hopes of getting on to Splash Mountain with no waits since it was still early in the morning. When we got there, the wait was 40 minutes. Ehh... we decided to hit Pooh instead. Once off of Pooh, we headed back towards the Big Thunder area and hoped we could hit Haunted Mansion and Pirates on the way there. However, Haunted Mansion was down and Pirates had a 35 minute wait. Wow, we were off to a rough start! We remembered Big Thunder had a relatively short wait when we went by it earlier so we headed back there. The wait board said 20 minutes, which wasn't too bad and at that point we needed to ride SOMETHING. So we hopped right in and chatted with a few Gumball Rally teams as we waited. 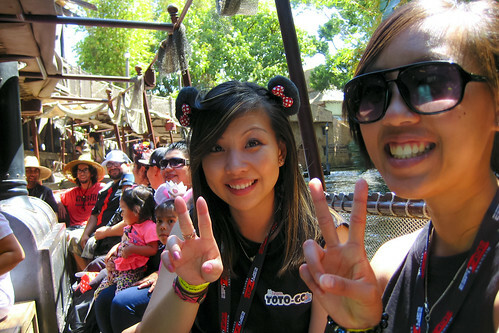 Here's us at Big Thunder! Christine was not amused with my selfie game. On Big Thunder, we were looking for a box in the "explosion" scene and had to see what was written on it. But when we got there, it was WAY too dark see anything! Panic ensued! My friend said MAYBE she saw the letter "B" on the box, but we all weren't 100% sure. Well, based on the letter and the letter placement in the word, we took a guess and wrote an explanation of what happened. Luckily for us, it turned out a lot of teams had the same problem. After Big Thunder, we headed over to Adventureland to see how the waits were for Indy and Jungle Cruise. Indy was too long and Jungle Cruise wasn't too bad. At that point of the day, any attraction with about a 20 minute wait was acceptable to us. 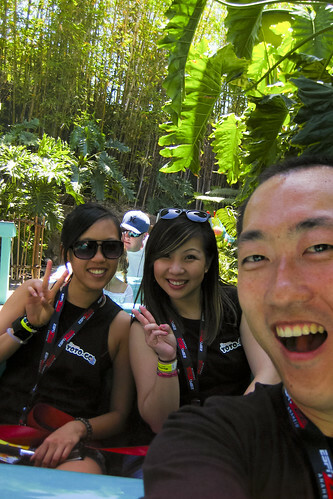 We decided to go on Jungle and skip Indy. On Jungle Cruise in the "Gorilla" scene, we had to look for a gorilla with a gun and see what the box to the left of him said. Here's a team picture of us while we were in line! 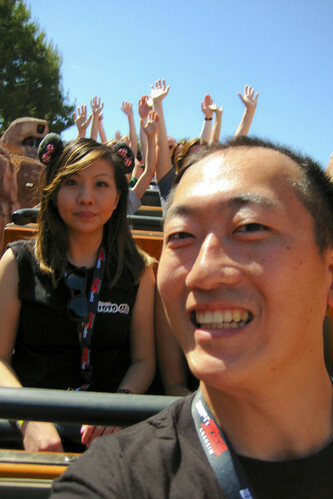 Here's us on the Jungle Cruise and ready for five exciting days and six romantic nights! 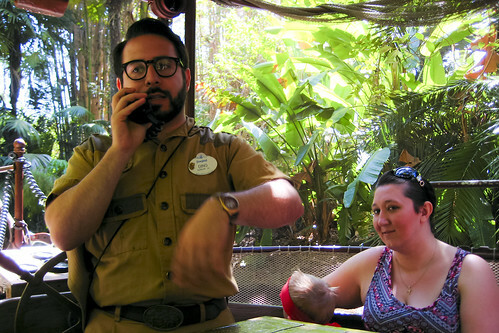 Our awesome Jungle Cruise Skipper, Dino! He was a hilarious Skipper! After Jungle Cruise, we saw that the Tiki Room was just letting out. 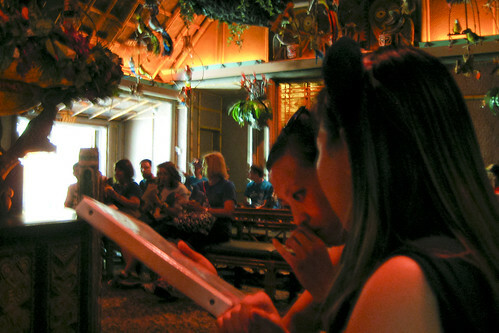 We beelined straight to Tiki Room and were immediately let in. Awesome! Here we are sitting and reading the next question while waiting for the show to start. 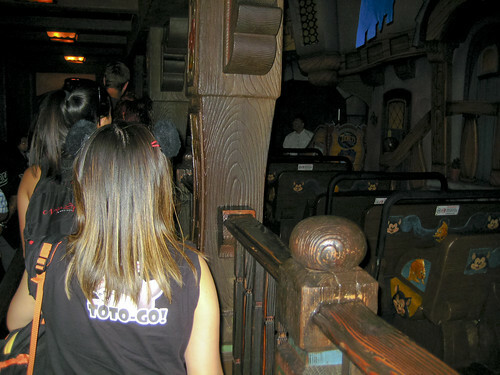 Right when Tiki ended, we decided to circle back to Fantasyland and see what the wait times were for the attractions we missed. The line for Pinocchio was out the door and the line for Storybook looked to be about over an hour. We decided to continue to It's a Small World. The line wasn't too bad so decided to hop right in. We were looking for the time on a clock at the end of the Switzerland scene. The dang clock was super small but we were able to figure out the time. It was getting close to 12:30PM at this point and we decided to rehit Tomorrowland and see if we could quickly get on any more attractions before heading over to DCA. We were able to get on Autopia realtively quickly, but JUST missed the Tomorrowland Movie preview. 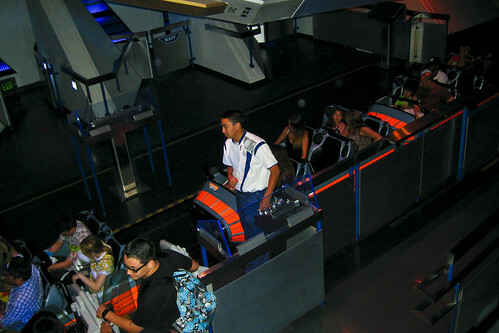 While deciding to ditch the preview, we saw the line for Space Mountain was super short! So we got in line and were able to get through in 15 minutes! It was getting kind of close to the 1:30PM mark and we wanted to hit some of the Main Street attractions on the way out. We headed over to the the Main Street Cinema to get a quick point, and missed an opportunity to get into Great Moments with Mr. Lincoln for another easy point (ugh!). We decided at this point it was probably best to switch parks. We headed over to the Picnic Area to turn in our Disneyland booklet and to receive our DCA booklet. When we were paging through the DCA booklet, we noticed there weren't that many questions for DCA. Uh oh, I guess we were going to have to do most everything at DCA. 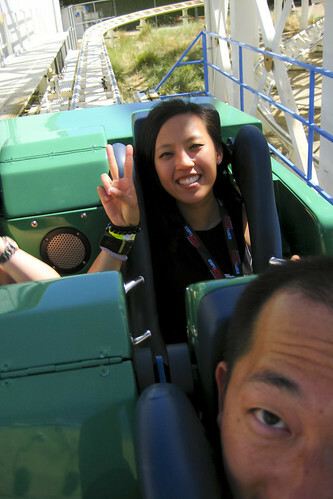 We entered DCA and decided to start at Hollywood Land and make our way around the Park. We went to first check the line for the Frozen Sing-a-Long attraction. I talked to the CM at the front and she notified me that I was welcome to wait in the Stand-By line but it was not guaranteed that we'll get in. Uhh, what? Okay, time to move along! After Heimlich, we headed to It's Tough to be a Bug and the Bakery Tour for another two quick points. 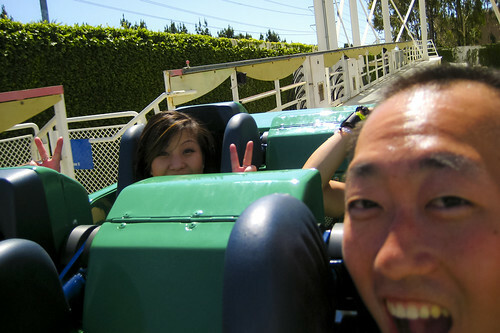 Then we went straight to the Paradise Pier area and got on Screamin'. Whoops, messed up this selfie! ... meh at least it's even lol. After Screamin', we saw Midway Mania's posted wait time was 35 minutes. It wasn't :( It took about 50 minutes to get through that line. Boy, I'm a bit rusty at this game! 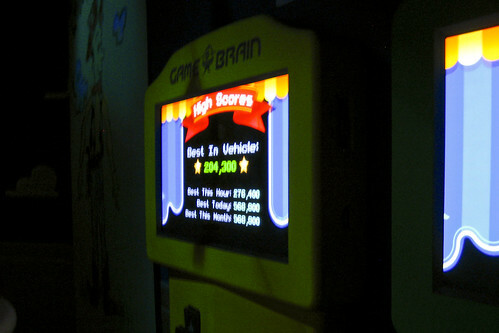 Once off, we headed towards Goofy Sky School and Little Mermaid to get a couple more points. We then headed to Grizzly River Run where we ran into the Grim Grinning Ghosts. They were pretty much on our tails the whole time we were at DCA. Grizzly was the first time we had a chance to chat with each other. We traded stories about our Rally woes and other Disney things. They were a fun team to talk to! It made the 40 minute wait for Grizzly fly by real quick. We got on the same raft together and soon were floating through the rapids. Once off the attraction, we said our goodbyes and went our separate ways. At this point, it was about 5:30PM and the Gumball Rally was scheduled to end at 6:30PM. 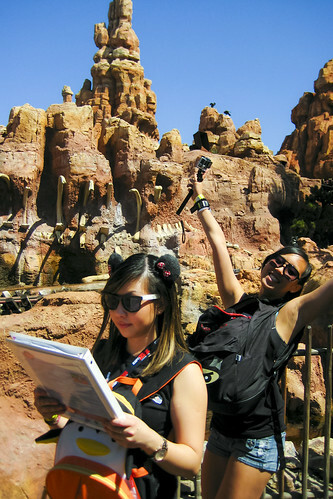 The only attractions we had left at DCA was Tower of Terror, Radiator Spring Racers, and the Frozen Sing-a-Long. We thought maybe we'd try to squeeze Tower in before turning in our booklet but as we left Grizzly, we got caught by the Pixar Play Parade! Ugh! 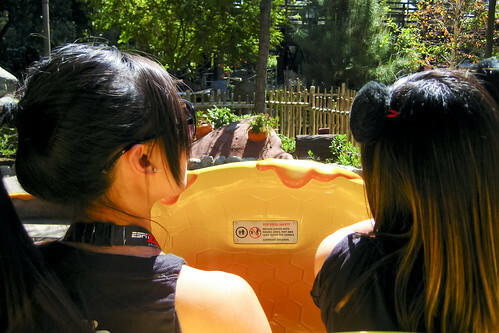 We were forced to walk around Paradise Pier and fight through the parade crowds. By the time we got to DCA's Wait Time Board, it was already 5:45PM and Tower had a posted 45 minute wait. Not willing to risk getting points deducted, we decided to end our Rally run. We left DCA and headed over to the Picnic Area to turn our DCA booklet in at about 5:50PM. Yay, the Gumball Rally was over! Time to bust out the phones! With so much time left before the Awards Party, we all decided to head back to Disneyland and hang out for a bit. We headed to the Corndog Cart for a Post-Rally meal. At the table we were sitting at, somebody left a perfectly good bag of chips on the table (I was quite tempted to eat it lol). We stayed at the table for a bit and reflected about the Gumball Rally. It was pretty much a consensus between us that the Rally was pretty rough this year. I knew I made some poor decisions and second guessed myself a lot this year, but my friends believed we did alright and I shouldn't have any regrets. I have pretty awesome friends. After eating, we decided to take one last team photo in front of Sleeping Beauty's Castle. It was about this time where my friend Christine had to leave for work. 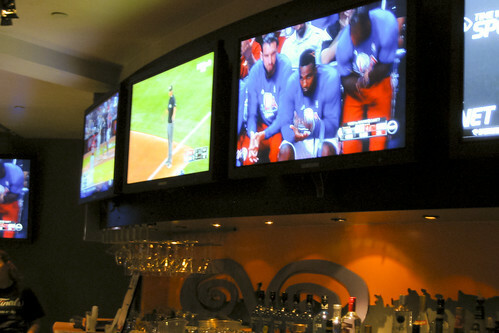 We said our goodbyes, then headed to the ESPN Zone to catch the rest of the Clippers vs. Spurs game (Go Clippers!). It was an incredible game! That last Chris Paul clutch shot was so amazing! Once the Clippers vs. Spurs game was over, Kristy and I headed to the Awards Party at the Anabella Hotel. 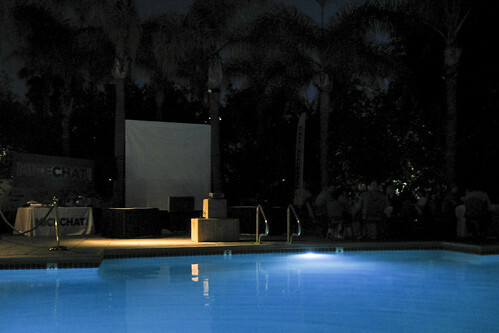 We were hanging by the pool waiting for the awards ceremony to start. We chatted a bit with some of the other teams. 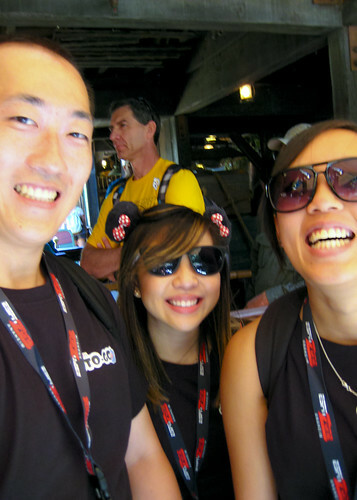 Yup, a consensus among all of us that this Gumball Rally was HARD. Pretty soon, it was time for Monorail Man's game show! 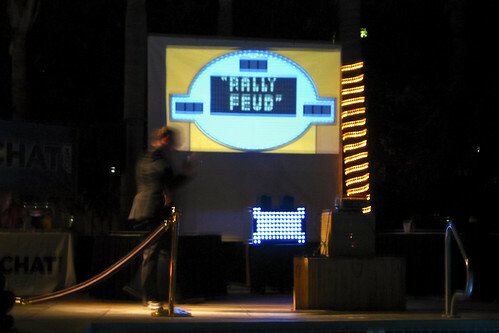 If you've ever participated in a Gumball Rally, you know each year Monorail Man creates the most amazing game shows. This year's was a Family Feud themed game! Amazing and fun as always! After the game show, it was time to announce the Top 10 Winners for this year's Gumball Rally. Not surprisingly, we didn't make it to Top 10. Bummer! BUT, our new friends, the Grim Grinning Ghosts, ended up winning the Gumball Rally! We were super excited for them! Yay, congratulations again! 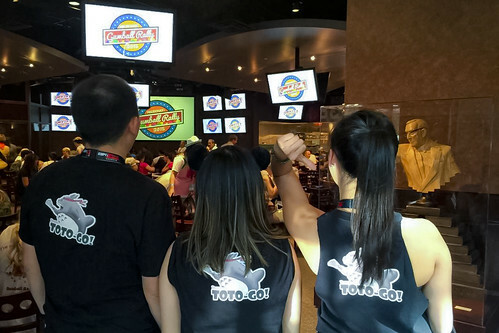 Once the winners were announced, the 2015 Gumball Rally was officially over! Kristy and I went around and congratulated the winning teams and said goodbye to our MiceChat friends before heading home. It was another awesome year and we had blast! Thank you MiceChat for putting together such an amazing event every year! We LOVE the Gumball Rally! It's definitely one of the things I look forward to every year! If you've ever thought about doing the Gumball Rally, DO IT! It's so much fun!